Though I’ve done many projects with my CNC, it’s also an outlet for my engineering and technical side. I’ve done a number of upgrades on the machine, but the upgrades I’ve been wanting to do the most - upgrading the 3-axis motion control to 4-axis (or 5-axis?) have been, until recently, out of reach. This video gives a pretty cool example of 5-axis machining! There are a number of articles about the business benefits of a 5-axis machine - more capabilities, faster machining, better finish, better accuracy, etc. Most content focuses on the business benefits because, until the past few years, 5-axis machines were just simply out of the price range of small workshops, both due to the hardware cost and the software availability and cost. In some machines, not all the axes can be moved simultaneously. This is typically the case with the 4th or 5th axis, and is often a limitation more of the electronic controller (or perhaps the software) more so than the underlying hardware. In theory, a machine with positional capabilities can mill exactly what one with full simultaneous movement can mill - just much more slowly as it repositions the material between each operation. For instance, the name engraved in the jewelry box above did not require that the Z axis be moved simultaneous to moving the X & Y axes, so it could be done with a more limited system. For some designs, positional-only axes are not problematic, but other designs (such as the XYZ frame) would become unpractical with a less capable machine. and probably fail with that bat, because it would be holding that bat only at one end, so the bat would probably deflect somewhat when milling at the opposite end of the table / clamp. I have neither the floor space for another substantial machine, nor the budget for to buy a pre-built $5k+* machine with more capabilities. And also, part of the fun for me is building the machine, so a prepackaged solution would just give me less enjoyment (even if it might perform better). So what are the upgrade options for my current Inventables X-Carve machine? * $5000 is an amazingly inexpensive price for a five axis machine, and was only recently achieved by PocketNC in a 2015 Kickstarter with a small machine. More typically, a 5-axis machine costs $20k+. But first, some big limitations. There is no practical way to get additional axes by angling the cutting head - this would require a much stiffer machine, given the weight of the motors and the offset that would introduce to the spindle from the current gantry. So while it’s not impossible, given all the hardware that would have to be rebuilt or upgraded, it’s a route I’m not going to pursue. So that means the options I’ll be exploring involve installing hardware between the milling head and the material being operating on: perhaps placing it right on the surface of the existing wasteboard, or perhaps cutting into the wasteboard and placing it below. The third approach definitely seems doable, though I’m hesitant because that extra height will introduce some extra lever forces on the gantry. This simply requires a hardware addition like this $400 Sunwin rotary axis. After installing that, I can simply switch between XYZ & XYA by rerouting the cables from one of the Y axis motors to this motor via a 4PDT switch. I have some questions about machine holding it’s Y-position while milling with no power on the Y axis motors, but theres an easy solution to that, via running power through some of the Y-axis stepper motor windings while milling. I can make the lathe add-on adjustable and removable via embedding a pair of T-slot rails ($18 for a 30” section from Rockler), which would require cutting into the wasteboard. But other than that, there’s no major electrical or machine modifications. Without further changes to my machine, this would allow me mill cylinders of up to about 4-1/2” in diameter, and up to about 30” long. Or if I want to cut into the wasteboard and mount the axis at the surface of the board, I could potential carve something up to about 9” in diameter. This upgrade starts with the same upgrade as above to get the rotational A axis in place, but then requires some additional major electrical upgrades. The “X Controller” electronics that came with the X Carve machine can’t control a fourth axis, and isn’t expandable to do so - while it has 4 stepper drivers, two of them are paired together to drive the two motors on either end of the Y-axis. So I need to completely replace the controller. A few years ago, I’m not sure what hobbyist / small shop options, if any, were available or affordable. But I recently came across a number of options via a few Chinese manufacturers, such as this $350 controller. It has poorly-translated documentation, and I have low confidence on the support I might receive should I purchase it, but it’s hard to beat the price, and with some patience, it’ll probably be workable. But that’s not quite enough: it puts out pulses for the stepper motors, but does not actually drive them. I need to couple that with five drivers like this $36 device for the stepper motors. And I need a hefty power supply for 5 x 4A drivers (plus the controller). However, one advantage of this is that it looks like once I transfer a program to the driver, I no longer need to keep my trusty laptop next to the CNC. So, this is probably about $700 in electronics (plus the $400 for the rotational axis hardware above), and a lot of patience. But it has the same fairly substantial size capability as above: 4-1/2” diameter without cutting into the wasteboard, or 9” diameter if I do, by 30” length. Here’s where the vertical limitations of the X Carve become an issue, unless I mount the these so that the table surface of these devices is flush with the current X Carve wasteboard, and cut out more material around it so that the device (and the material I’m milling) has freedom to move. At that level, I could do full five axis carving on roughly a 5” cube. 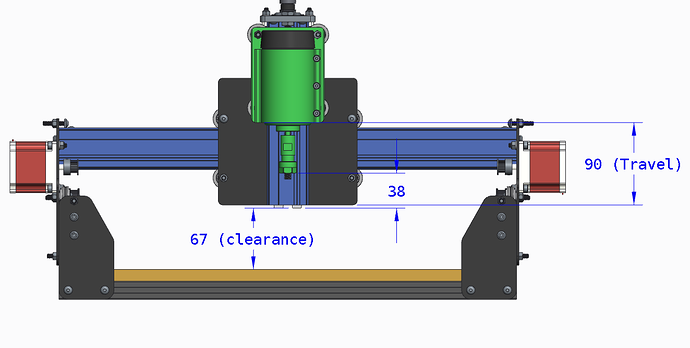 Or if the table were mounted below the level of the X Carve, I could probably get to a 7” cube, limited by the vertical reach of the spindle and tooling. So that’s a lot of investment for a relatively small work area. In all of these upgrades, I’ve skipped over one area that has proven incredibly difficult in the past: the software necessary to design and generate the computer code for four or five axes. While not easy, this is now approachable and affordable, via the free (for educational and hobbyist user) Fusion 360. I’ve sung the praises of this software in an earlier blog, and make copious use of it to explore ideas both for myself and to render designs for clients. But it turns out it has standard 4-axis and 5-axis milling capabilities. Though I’ve had limited opportunity to explore them so far, a number of reviews indicate they’re great to start but may be somewhat lacking in complicated modeling. Nonetheless, it’s great to have a free option with which to start, rather than investing thousands in a software package that I’d rarely use. Given that each of these three upgrades is incremental, each step is relatively modest additional investment to get to full five axis, so long as I have need for (and can maintain the use of) each of the previous capabilities, including standard XYZ carving. I’ve spent a lot of time researching the options and capabilities - but now time to (gradually) make it happen! Hopefully, I’ll have time to do that in between commissions and shows in the coming months, and will share back out what I learn in the process. What projects would you like to see me tackle when I complete any of these upgrades? Or what have you learned in building or working with your own CNCs?